The sunday 22th (2001), in la Martinique island (french caribbean), we had a really fantastic wether. no wind !! Incredible. We went with friends (they are not collectors) swimming on a small beach in north caribbean sea, which is not at all frequented by tourists. As we arrived by 11h00 in the morning and we went straight in the sea. All of us (6) started to go to the left side of the beach. We saw a few minutes later some Strombus specimens (all kinds). 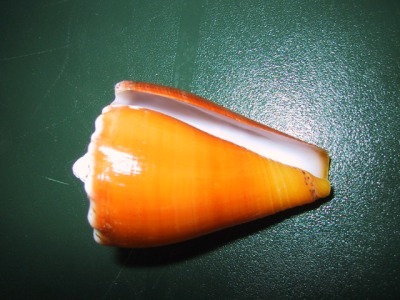 We found also a few fresh dead Cypraea cinerea and pomum Murex. 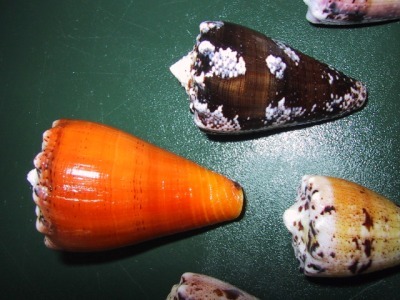 As the seabed started to change, i instantly noticed that i entered in a Conus regius typical habitat. smaller rocks and big sandy grains (in fact kind of very small little rock fragments). second rock aside the first one : second specimen, but this time it was a "citrinus" one. Then, we started to hunt in this spot for about one hour. 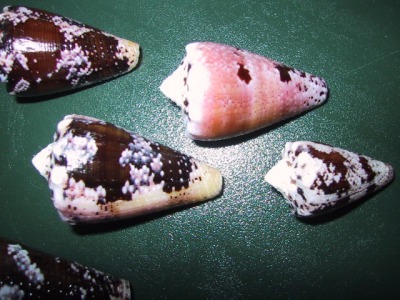 We found 14 speciemens of all size and color… (have a look at the 2 pictures below). I let you now enjoy the pictures. 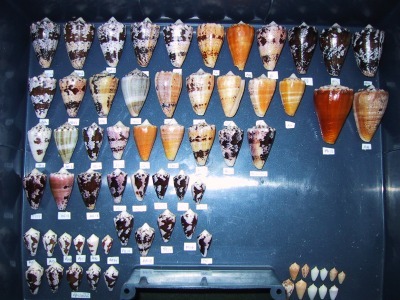 Those finds really doubled my collection of Conus regius specimens (and Conus mus). 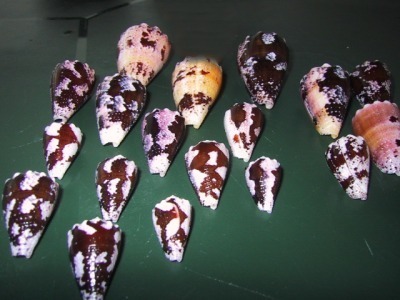 Here you will see my finds during those 5 months of shelling..